Russell Garbutt: Thanks for your comments but we don’t agree with them. Sent: Tuesday, 22 January 2013 10:46 a.m. Your editorial on the urgent need for an austerity budget for Dunedin is too little too late. For years now at Council Plan consultation meetings also attended by your reporters, the financial stupidity of the Council’s decisions have been graphically pointed out by a long line of submitters. The practice of Council owned companies being forced to borrow to pay dividends which you now describe as being “worse than poor” was emphasised by a large number of submitters, but largely ignored by the ODT for many years. While ultimately all of the spending decisions made by the Council are those of the Councillors – many clearly out of their depth – the weight of public opinion assisted by informed and investigative stories by the City’s only daily paper, has no small part to play in what has happened in this town over recent years. It is hard to see why the ODT has failed to meet its obligations or role in this regard. Many believe that it is because the ODT is a strong supporter of the stadium which has caused a major part of this debt, and of its proponents and major user. While the ODT has adopted a position of supporting the new rugby stadium, even now that the full costs of the stadium are more or less known, your position is that you appear to be supporting the establishment of a significant fund to subsidise the use of the stadium – despite your reluctant acknowledgement that while the fund will cost the ratepayers dearly, there is no believable data that shows any tangible benefit. I look forward to the ODT being part of the process in holding those that have made the decisions that have put Dunedin into these astronomical levels of debt responsible and accountable – but I’m not holding my breath. Read Russell’s comments in reply here. Journalist sums up 2012, against the ‘odds’ how does it rate ? It was the year that had a bit of everything. A bit like most other years, really. Nigel Benson looks back on 2012… Dunedin wakes up with a New Year’s Day hangover, but feeling rather smug. The driest December since 1918 has brought the best weather in New Zealand, while heavy rain and floodwaters sweep the rest of the country. We always enjoy the news. We note the abridgements, deletions, non-acknowledgements and hijackings that meant the most concerning news generated within our Community never got through. No “lack of political motivation”, as ’twere. Consolation Prize: DCC continues to ‘advertise’ with ODT, by special arrangement. Blissfully unaware, or deliberately avoiding and shielding knowledge of the fact, thereby keeping the public and media at arm’s length from the true state of council finances relating to the stadium project? That is a question for all elected representatives at Dunedin City Council, the council’s chief executive, the executive management team (EMT), and the governance manager. Sadly, the annual reports don’t tell the full story of the ‘stadium effect’ – that is, the figures that Dunedin renters and ratepayers will be facing, and unable to pay, when the whole system is called to ‘correct’. It’s as if the newspaper editor has suffered a blunt contusion. Sees the problem then runs away to John Wilson Ocean Drive (closed from August 2006), and ends weakly, out of steam, with the hope that those in power “will turn their full attention to making our new stadium a profitable investment of which the city can be proud”, and would they please read the annual report[s]. Just as it seemed the Dunedin City Council was determined to focus on a different attitude towards debt, revelations that a worse-than-expected $3.2 million loss by the company running the Forsyth Barr Stadium was not even discussed at this week’s full council meeting have put it back in the firing line and raised questions about its priorities. The loss – nearly $1 million greater than forecast – was recorded in Dunedin Venues Management Ltd’s (DVML) 2011-12 annual report, which was released a day later to this newspaper. But it had flown under the radar at the council meeting, with no mention of the reports on DVML or Dunedin Venues Ltd (DVL), which owns the stadium, on the meeting’s public agenda, and no indication those reports had been circulated publicly and to media – as required under the Local Government Official Information and Meetings Act – ahead of the meeting. The reasons for that are unclear and convoluted. Many residents of a small coastal town are refusing to pay for a $58 million debt that has crippled their local council and left them with the bill. 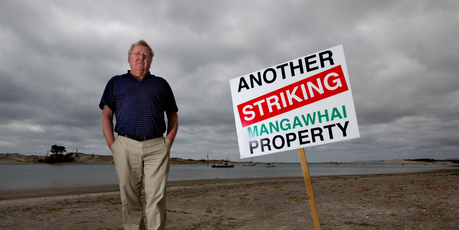 The Mangawhai Ratepayers and Residents Association chairman Bruce Rogan has at least 500 local residents refusing to pay an estimated $1 million in rates this year because the Kaipara District Council secretly ran up an unsustainable $58 million debt building a sewerage treatment scheme for about 2000 people who own homes here. Dare we say, Dunedin, the amount currently owed by each city ratepayer well exceeds that owed by the good ratepayers of Mangawhai, on the Kaipara.